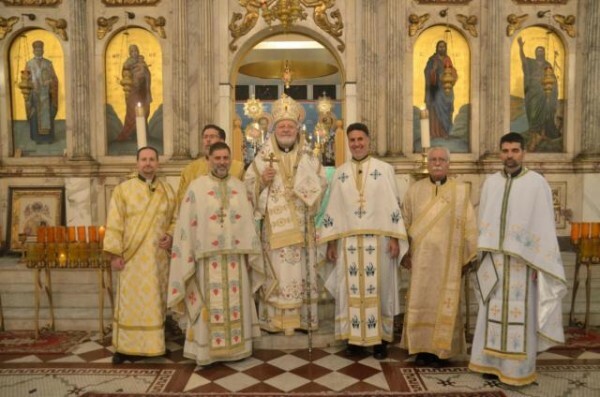 On Sunday, July 27, 2014, His Eminence Metropolitan Joseph visited St. Nicholas Antiochian Orthodox Cathedral of Brooklyn, NY for the first time since his election. Saint Nicholas is the Mother Cathedral of the Archdiocese and the seat of the new metropolitan. Although many of the Cathedral faithful were out of town for summer vacations and travels to visit family overseas, a large crowd nevertheless came to greet Metropolitan Joseph. During his homily, Sayidna Joseph told the congregation that while this was his first visit to the historic Cathedral as metropolitan, it would not by any means be his last. At the end of the Hierarchical Liturgy, Cathedral Dean and Vicar-General Archpriest Thomas Zain, and Vice-Chairman of the Cathedral Council Mr. Samir Khoury, presented His Eminence with an engolpion (an episcopal medallion) of the Theotokos, offered as a gift from all the Cathedral clergy and faithful. Many years to our new metropolitan!